00:25 Telephone Road. the Telephone Road. 00:32 woli-te East-West Road. and right on to the East-West Road. 00:44 naka sipuhsis tuciye. and a brook goes by. 00:50 kempok ntoliyanen. we went to the camp. 00:57 nkisi-’tutuwatomon papskot. I lit the stove. 01:04 on natqahsinen mahkiyew. we went to lie down for a bit. 01:14 nutahanen apc, menakac. we went out again, driving slowly. 01:16 Utenek ntoliyanen. We went to town. 01:23 naka-te apc nituwiyek. and other things we needed. 01:45 woli-te kempok. right to the camp. 01:52 nkisapuwanen kahpe. we had some coffee. 01:57 motapahane" let’s go down"
01:59 — nilun Frensis. Frances and I. 02:01 Nmotapahanen kempossisok. We went down to the little camp. 02:03 Four-wheeler npomuwehkahan. We used the four-wheeler. 02:10 wot tahk pemaptaq mus. and there were moose tracks. 02:12 Nit-al ’tutaptun. The tracks were that big. 02:15 Solahki-te pskehe. All of a sudden the tracks turned. 02:17 Tett oloqi-pskehe oloqiw, tinahkatik. He’d turned to the right. 02:23 On nilun macahanen kempossisok. So we went back to the little camp. 02:30 nkisapqotehtunen kempossis. we opened up the camp. 02:35 Yut-olu ntotolapuwepon kahpe, qocomok. We were drinking coffee outside. 02:50 kamotu tett metehtaqsit. and suddenly we heard something. 02:57 "Mus not metehtaqsit." "That was the sound of a moose." 03:04 apc motehtaqsin. it could be heard. 03:09 Nwecuwawkomon sitom. I would go down to the shore. 03:18 ma-te keq. Apc natopin. and there was nothing. So I went to sit down. 03:29 apc natsakihtun sip. then I went back again to look at the river. 03:36 etoli-koti-cuwahpessit. he was about to go into the water. 03:38 Ntapiptun peskuwat. I went to get my rifle. 03:44 ’tolomi-ksokahomon. and swam across. 03:46 Mam-ote nit waleyik olomi-kpiye. Finally in a deep spot he went up onto the shore. 03:53 etqehkuwane. "Okay, let’s go head him off." 03:58 Ntepessinen oqitonuk, nmacahanen. We got into the canoe and took off. 04:04 tett ntoloqiyanen. we went that way. 04:13 nit nankomiyat, waht pihcetu waleyu. "If he keeps going that way, it's deeper over there." 04:17 Yut-olu tehpu milawte kekesk. But here, the shore juts out a little bit. 04:25 nkisi-wihqahtun kekesk oqiton. I pulled the canoe up a little. 04:28 Nit-ona ’toli-sakhuhsan. He suddenly appeared walking through there. 04:31 ’Toli-cuwahpuhsan. He stepped into the water. 04:33 Nit-tehna npeskhan. And then I shot him. 04:37 nit-te oloqi-ckuwi-nahtokassin. right off he started coming out of the water this way. 04:43 ncituwamqehteluwa. The shot made his head go down. 04:45 Tehpu alokuhuke. He was just floating around. 04:53 Neket-op wot ’totoluwikhikan Frensis. Meanwhile Frances is taking pictures. 04:56 Ntolitahasihpon camera ma-te ’tihiwon. I thought she didn’t have the camera. 04:58 Itom, "Pol ntuwikhoman, ntuwikhan." She said, "First let me take a picture, take a picture of him." 05:01 Ahtoluwikhiket nekom. She kept taking pictures. 05:06 ntoqiton naka ntepessin. and got in. 05:12 life preservers, woniyakonok. put on life preservers, around his head. 05:18 mam-ote wahkac. and barely got him out of the water. 05:26 Yet ntolahqepilanen. That’s where we tied him. 05:29 On yaka nuckuwi-apaciyanen. Then we started back. 05:36 tokkiw kempossisok. to the little camp. 05:39 Nan aciye nehpuhukot. It was five o’clock when we killed him. 05:46 ncuwi-wihqahtunen oqiton. we had to pull out the canoe. 05:51 Apc ntoliyanen kci-kempok. We went back to the big camp. 05:56 apc yet ntepessinen truck. we got back in the truck there. 06:00 On yaka nutahanen. And then we came out. 06:08 "Mec-op-al nkisuwekan your telephone?" "May I use your telephone please?" 06:11 Itom, "Haw." He said "Go ahead." 06:12 Ntiyahpon, "Nehpahan mus. I told him, "We killed a moose. 06:14 Help npeci-naciptunen." We came to get help." 06:22 "Nehpaha mus. 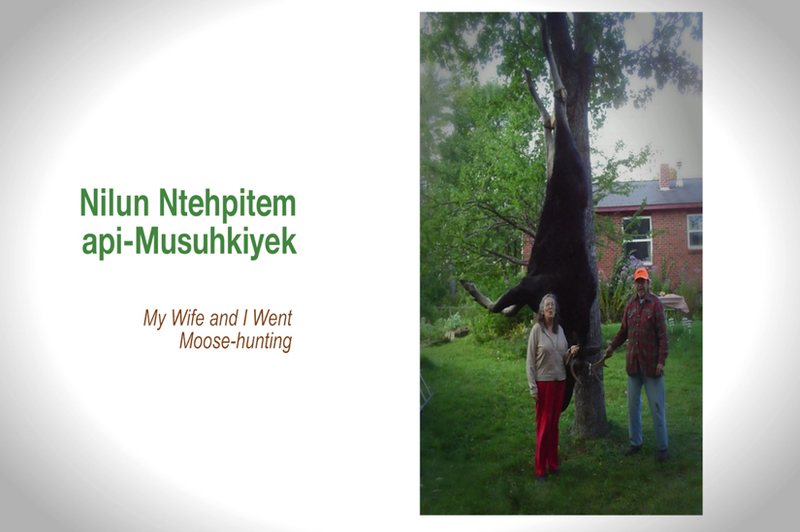 "I killed a moose. 06:28 weci-kisi, iyey, nutehlukot." so we can get him out. 06:37 weci-kisi-tepehlukot. so we could load him into the boat. 06:48 with a boat. with a boat. 06:50 On weket, ma wolessiw, ’tapaciptun. But that one didn’t work, so he took it back. 06:55 Apaciptaq on ’peciptun oqiton. What he brought back was a canoe. 07:03 kis eight o’clock. it was eight o’clock. 07:10 nmacahawotinen kempossisok. we left for the little camp. 07:13 Mile nit tuton. It was a mile off. 07:23 kempok iyu. he stayed at the camp. 07:29 Nkocicihtun te tuttek. Yut tahk I knew right where it was. 07:33 nikk kotokik. the others would know. 07:36 Nita, nmacahanen. Well, we left. 07:38 Nilun nisuhkomupon, iya, Rodney and I were in one canoe. 07:41 Rodney. Louis-olu ’qotuhkayiw. Rodney and I were in one canoe. Louis, though, was alone. 07:49 wot mete-oqimit. he could be heard calling. 07:53 nwihqahtunen oqitonul. we pulled the canoes ashore. 08:01 ewepacqehlanen. Ntama. dragging him up. But no. 08:07 waht-ote ntutomipon notqinnuk. standing in it up to our knees. 08:11 Nita, mam-ote wahka nkisehlan. Finally, we just managed to get him done. 08:17 etutkamit. was so big and fat. 08:21 nisonul. Nit-al qoneyuwol. two pieces of it. They were this long. 08:24 Yut lamiw. Here inside. 08:28 Kcicihtuweksopon nuckuwiptunennul. If we had known, we would have brought them. 08:30 Yut tahk nit-te elahkiyek. But they’re where we left them. 08:34 Nita, mam-ote nkisi wolehlan. Well, we finally got him cleaned. 08:40 yut on the bank. up onto the bank. 08:47 peciptaq. into the canoe he’d brought. 08:53 naka eci-ksi-matolukiyak yut oqiton. and this canoe was pretty rickety. 08:59 Ntoqecehtunen. We all tried. 09:02 Naka kis tan-al aqane-tpuhkahk. And it was already completely dark. 09:08 nkisi-tepehlan. got him in. 09:12 Louis ’kisi-tepatuwan. Louis climbed in. 09:15 Cipotu kal nit olpehson oqiton. Maybe there was that much freeboard on the canoe. 09:20 Eight-hundred-and-fifty pounds li-pqanok not oqiton. That canoe could hold eight-hundred-fifty pounds. 09:27 naka nit kehsossok iyey, pcossol. and that’s how little freeboard was left. 09:30 Nit oqiton, nit-tehp ktoqtapehe. That canoe, it could easily have sunk. 09:35 Nekom kisi-tepatuwet. He climbed in. 09:38 On yaka nmacahawotinen kempossisok. Then we all left for the little camp. 09:47 Welessik ma, iyey, wocawsonu. It’s a good thing it wasn’t... windy. 09:51 u, ktapehe-tehp. oh, it would have sunk. 09:56 Nita, mam-ote kempossisok. Finally, we get to the little camp. 09:58 Nita, nkisi-nahtokahlanen. Well, we got him ashore. 10:02 Yut-olu four-wheeler ’tiywal winch. This four-wheeler had a winch. 10:07 ntahtoli-wihqacqimanen. hauling him in. 10:13 On yaka four-wheeler napicehlanen. then hooked him to the four-wheeler. 10:18 tokkiw kci-kempok. the big camp. 10:28 on yaka ntepehlanen truck-ok. and then we loaded him onto the truck. 10:31 On yaka nuckuwyawotinen. And then we came out. 10:43 aqamok two o’clock. it was after two o’clock. 10:50 aqamok two-thirty. it was after two-thirty. 10:53 Nit-te elopit mus ’qoci-tpuhk. That’s the way the moose stayed for the night. 10:56 Apc yaka kisi-pasqek on yaka ’peciyaniya. They couldn’t get back until the afternoon. 11:04 Nkisekhulanen. We hung him up. 11:12 on nilun Frensis posehlanen. so Frances and I skinned him. 11:19 Temonu kmessunomulonul. I’ll show them to you later. 11:28 nmace-soqskehlanen. we started cutting him up. 11:33 Miya-te Louie ’peciyan naka, iya, Steve. Just then, Louie and Steve arrived. 11:40 naka nokka-cepiksaniya. and finished cutting him up. 11:44 eci-tkeyik. where it’s very cold. 11:50 on yaka nokkasomoniya wiyuhs. to cut up all the meat. 11:59 naka npunomonen, ihik, freezer. and put it in the freezer. 12:02 Nit psiw welaqek toke. That’s where it’s all stored now. 12:05 Nit… nit nit nulelomoqekhukun, iya, mus. That moose gave us good luck. 12:12 Nit-te msiw. That’s all.